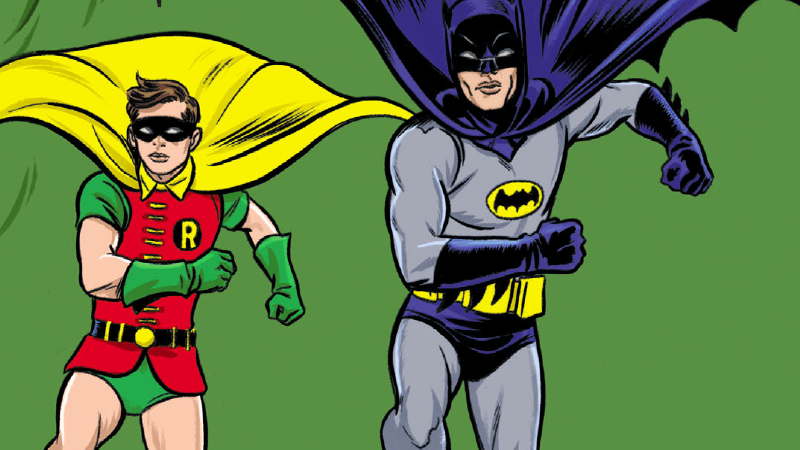 It’s far too soon for this amazing series to have come to a close, but sadly, it is the end: DC’s delightful digital series based on the world of the campy 1960s classic Batman TV show is over. But thankfully, its final chapter was perhaps one of its most inspired issues in the whole run. Spoilers ahead for Batman ‘66 Chapter 73, by Lee Allred, Michale Allred, and Laura Allred. The way the Allreds manage to explain and capture each shot—the vivid green background being a green screen draped across the studio set, the green-tinted thugs that appear out of it the disguised form of Clayface—is so well done you can’t help but grin throughout. Every moment is there, every bif!, baf!, and pow! There’s just added dialogue that you never heard over the catchy theme tune instead. There’s even an homage to the credit sequences’ weirdly slow-moving Batmobile, as it “races” in at the end via Autopilot to save the day. It’s a fitting goodbye to a series that has done so much to capture the vibe and feel of the classic TV show—and with Batman’s promise at the end of the issue for more adventures on the way (in the form of the TV series itself), it’s a wonderful way to both say farewell to such a delightful comic and feel hopeful that there could always be more for this incarnation of Batman and Robin the future. Honestly, now that it’s actually happened, I can’t have imagined this comic ending in any other way.